Minister of State for Environment, Forests and Climate Change Prakash Javadekar, on Monday, said the fire which destroyed around 2,000 hectares of forest land in Uttarakhand would be put out in the next two days. Several incidents of forest fire have been reported in the state in the last few weeks. Thousands of firemen have been battling for days to douse the fire. Teams of National Disaster Response Force (NDRF) and the Indian Air Force (IAF) have also been deployed to assist the firemen. Javadekar said that the federal and state government was working together to solve the problem. "In the Uttarakhand calamity, the Prime Minister's office and the interior minister worked in tandem and we got help from the Defence Ministry, the NDRF (National Disaster Response Force) and our officials from the forest department, who were over 6000, have been battling there. All their combined efforts have resulted in controlling 90 per cent of the fire as of now and in two days the danger will be over," Javadekar told reporters here. Extreme dry weather with no humidity was the reason behind the massive fire, he said. 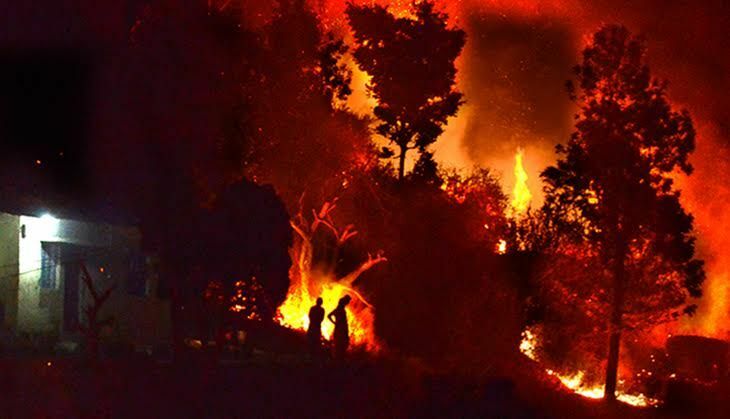 Meanwhile, the fire which broke out in the forest areas of Bathuni and Gambr in Rajouri district of Jammu and Kashmir on Sunday was brought under control. "I have talked to the sub-divisional magistrate and they have informed me that our teams are working on the fire which broke out last night. It was a ground fire and we have gained control over it. I have requested them to increase their surveillance teams," said district magistrate, Ravinder Kumar. Northern India is reeling under severe heat with temperatures rising upto 48 degree Celsius in many parts. Rising temperatures and prolonged dry spells make forests more vulnerable to catching fire. Forest fire was also reported from Shimla in Himachal Pradesh where flames and thick smoke was seen billowing from dry leaves and grass on fire. J&K's water war: why is NHPC being likened to East India Company? READ NEXT >> J&K's water war: why is NHPC being likened to East India Company?